I think one of the first online pattern magazines a new knitter encounters is probably Knitty.com — at least it was for me. The patterns are fun and funky, feature designs from a great mix of established designers and up-and-comers, and (probably most importantly to the newer knitter) are free. The spring and summer 2013 issue just came out so let’s see what we can find for inspiration, shall we? Now that I’m a spinner, I really enjoy the Knittyspin features. This scarf is Foliolum by Joanna Johnson and is knit from handspun yarn. She spun a 50% yak/50% Merino wool blend into a sport-weight yarn and then knit this lovely, simple scarf with a pretty crocheted edging. I tend to think that simpler patterns showcase handspun yarns the best (at least with my handspun! ), so I could definitely see myself using this one in the future. I also just really love the styling of this photo: it definitely evokes bright, leafy springtime for me. 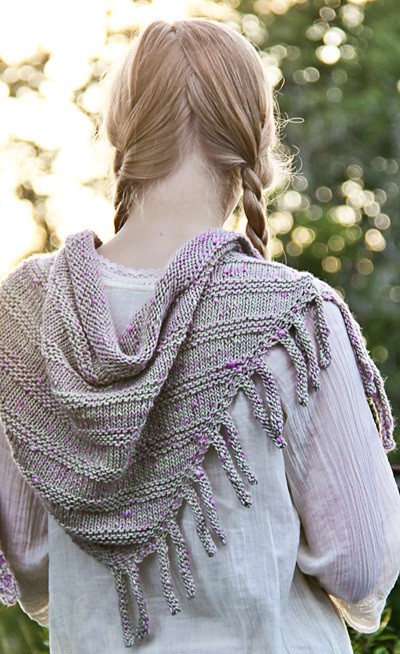 This little shawl, Lunatic Fringe by Jennifer Dassau, is super fun! It’s knit from the bottom point up asymmetrically, with those finger-like fringes created by casting on and binding off stitches along one edge of the row. I love knits that are creative with interesting results, but that are relatively simple to knit (busy lifestyle and all) so this one definitely fits the bill. Plus, it would work well in almost any weight yarn and probably great for handspun, too. I briefly met the designer at Stitches East last October because she is one of the diehard Malabrigo Junkies and she was super nice. I recommend you check out her patterns on Ravelry because she has lots of great stuff in there! Aaaaaaand then we have the gigantic and impressive knitted item that I will probably never make but that I enjoy admiring from afar! This is the Easy as Pie blanket by Anna Richardson. For this blanket, the designer worked out how to make circles from garter stitch short rows and then again used short rows to square off the area around the circles… and then somehow joined them together. I love the design concept and the use of colors and I am just always awed when people write patterns for ginormous knits. That’s a lot of knitting to do and keep track of and translate for others! Which pattern are you drawn to from the collection? Has something else been inspiring you lately? Please link along below and share! 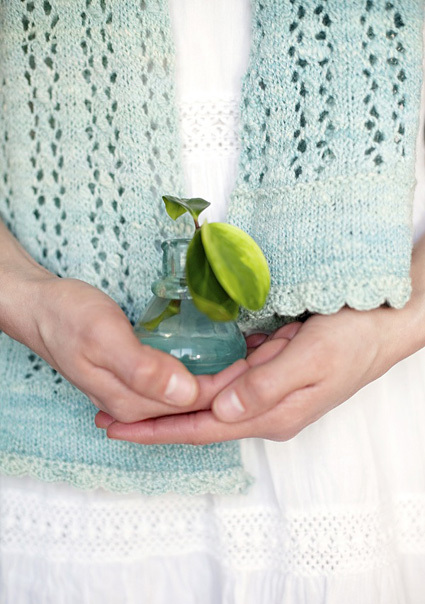 This entry was posted in designers, InspirationSaturday, Knitty by shoelaceswitcher. Bookmark the permalink. Oh wow, yeah! Slipstream is super intense. 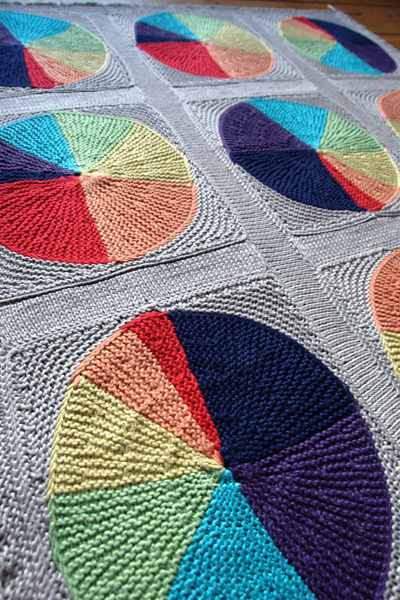 Wow, that Easy as Pie blanket is impressive, the math that must have gone into designing that pattern! Sometimes I adore Knitty and other times I look at the newest issue and nothing at all appeals to me. Many of these patterns look very cute! The blanket would be quite the challenge for me though! Thanks for the inspiration! I think my favorite is Franklin Habit's rework of the baby slipper/socks. So cute! Sorry–having trouble getting my comment to post. This is Noreen, of longlakeyarns.net.